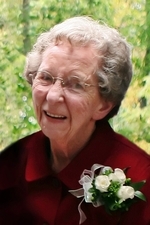 Patricia L. (Pat) Rindom, 88, Atchison passed away Monday, January 14, 2019 at the Atchison Hospital. Mass of Christian Burial will be 10:00a.m. Thursday, January17th, 2019, at St. Joseph Church, with Fr. Jeremy Heppler, OSB, as celebrant. Burial will follow in Mt. Calvary Cemetery. A prayer service will be at 7 p.m. Wednesday, Jan. 16th, 2019 at Becker-Dyer-Stanton Funeral Home, with visitation to follow until 8:30p.m. In lieu of flowers, memorial contributions are suggested to Atchison Senior Village or Parkinson’s Foundation of the Heartland and may be sent in care of the funeral home. Online condolences may be left at www.beckerdyer.com. Pat was born December 7, 1930, in Atchison, the daughter of Edmond T. Eccher and Anna J. (Evans) Eccher. She attended St. Joseph Grade School and graduated from the Mount St. Scholastica Academy. She then attended Mount St. Scholastica College, now Benedictine College. She and L. Bart Rindom were united in marriage on June 28, 1952 at St. Joseph’s Church, Atchison. Bart preceded her in death on June 18, 2011. She was employed at Southwestern Bell for six years and left to raise their seven children. After their children were in school, she worked for Benedictine College in the bookstore for 25 years, retiring in 1997. She was a member of Sacred Heart Church, Sacred Heart Altar Society, assisted with funeral luncheons for members of the church and assisted at the Sacred Heart Thrift Store. She was also a former member of the VFW Ladies Auxiliary. Pat was an avid sports fan and especially enjoyed Kansas City Chiefs, Notre Dame and Kansas State football. Survivors include three daughters, Teresa Bohon, Leawood, KS, Carol (Marty) Coffman, Tecumseh, KS, Mary Beth (Tim) Gillock, Overland Park, four sons, Dave (Brenda) Rindom, Lenexa, Phil (Kaylene) Rindom, Atchison, Tom (Amber) Rindom, Leawood, Mike (Amy) Rindom, Stuart, FL, 15 grandchildren and 23 great-grandchildren. Also surviving are two sisters, Donna Armontrout, Overland Park, KS and Barbara Eccher, Atchison, KS. She was preceded in death by her parents, a sister Virginia, and three brothers, Richard, Al and Gerald.